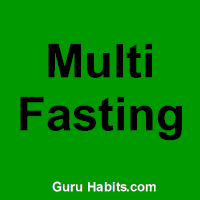 I’m doing what I’ve named “multi fasting.” Multi fasting consists of a traditional food fast along with other things, perhaps bad habits, you want to moderate, reduce, or quit. This might include things like television, advertisement, news, gambling, or gaming. I thought it would be beneficial to do them at the same time as a multi fast since they are often connected in some way. They may encourage more of each other, be addictive, generate withdrawal symptoms, and produce cravings. In addition, I thought it would worthwhile to include things you want to add to your routine like exercising, reading, or journaling. Or replace a time-wasting habit like watching television with journaling. My multi fast includes food, advertisement, and news. And on the add side, read more — especially during the time I’d normally be watching TV. Preparation – I’ve been preparing for the fast for about 6 weeks. I prepared for it by reading countless articles and watching dozens of videos about fasting. A few of the best videos are here. I also did an “intermittent fast,” where I’d only eat one meal a day, several times. In addition, I fasted for an entire day twice. And finally, I ate down my perishable food inventory and stocked up on my smoothie ingredients. Inspiration – The amazing benefits of fasting. Here’s how I’ve constructed my multi fasting experiment. Food – I will not be eating any solid food. I will only be drinking 10-ounce glasses of my vegan superfood smoothie and unlimited purified water. I will also continue to take my vitamin supplements. Television – I will not be watching any television. I will limit myself to commercial-free educational, personal development, and documentary videos. Advertisement – I will not be watching, reading, or listening to commercials or advertisements by any means including internet, print, or radio. News – I will not be watching, reading, or listening to the “news” by any means including internet, print, or radio. Exercise – I will continue to do aerobic, free-weight, and abdominal exercises, but with minimal intensity and length. If my body gives me any signals, I will stop or postpone it. Rest – I will sleep, nap, and relax as much as needed. Duration – I will fast for three (3) days and then evaluate whether to continue, take a one (1) day break, change to an intermittent fast, or stop.